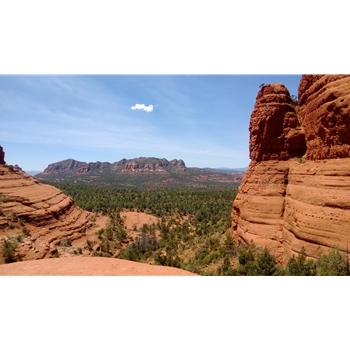 A very scenic, classic trail through the red rocks of Sedona leading to the Chicken Point overlook. Trail Description Little Horse Trail begins along the Bell Rock loop trail. Following this jeep trail southward for a quarter of a mile, you will come to a signed fork. Making a left, the trail start to climb gently and follows a few washes and through Arizona cypress patches. At the intersect of the Chapel Trail from the left, take a right passing through a gate boundary near 1.4 miles. Once you head through the ridge up to the Chicken Point, take the path left for a short climb onto the open rock range, full spectacular views. Note that this lookout is used by Jeep Tours heading up via Broken Arrow Road. If you a ready to leave, you can take the same way back or continue onward towards the Broken Arrow Trail. Note: this trail requires a Red Rock Pass - available at most gas stations in Sedona etc.